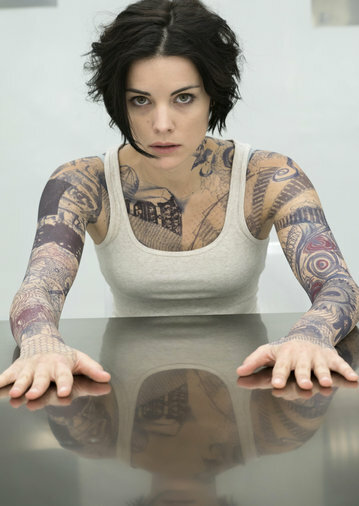 One of the most buzzed about shows of the Fall season, Blindspot, premiered last night. But for all of the dutiful marketing efforts, it came off like just another product from the mystery thriller factory. Blindspot stars Jaimie Alexander as “Jane Doe”, a woman discovered naked inside a duffel bag in Times Square. While in custody, the FBI discovers that her body has been pumped full of a drug that has caused a massive state of amnesia. Her tattoos quickly become the focal point as Agent Kurt Weller is printed in large letters across her back and, upon seeing one tattoo of Chinese characters, Jane finds she can read the language. The message of course leads the FBI to an apartment where someone has created a bomb and plans on wreaking havoc in New York. This expedition also affords a chance for Jane to uncover formidable fighting abilities. The chase leads the team to foil bomb attempts both in the subway and at the Statue of Liberty. And during a standoff, Jane also displays calm under pressure and marksmanship skills. The whole episode was beautifully shot, with crafty uses of light and shadow. Jaimie Alexander flexed her method acting chops to fully embody this woman that doesn’t even recognize herself in the mirror. And small peeks into her past and a mysterious man lurking around the team offer the beginnings of a mythology that could prove to be interesting. Still, this show requires a significant suspension of belief. Her body being covered in tattoos feels more like a means for story inspiration than a solid premise for a show. What happens when they look to the wrong tattoo for answers? Or if they just miss a tattoo clue? As glimpsed in the pilot, a lot of the tattoos are sequences of numbers and characters. Couldn’t these be interpreted any number of ways? In the end, Blindspot gave me a strong The Blacklist vibe, another strong performer for NBC, with its dark themes and answers clearly being kept just behind the curtain. I predict this show will be another consistent ratings earner for NBC, but for my tastes, it all feels just a touch too formulaic. Check out the promo for next week’s episode below.